Do you ever heard this quotes before? “When In Doubt Wear Red." Just like that, when sun burning your skin use Marina Body Essence SPF 30 to save your whole skin! I lived in a city with 30◦C-31◦C everyday if rain not coming. It means I need extra protection of my skin. As I know Pekanbaru is an oil city they called, we lived above oil so that’s why my city has a very pungent heat. If you are under sun exposure at least for 30 minutes without jacket or umbrella you will feel your skin burning and it takes a week or more to get back to your normal skin tone. 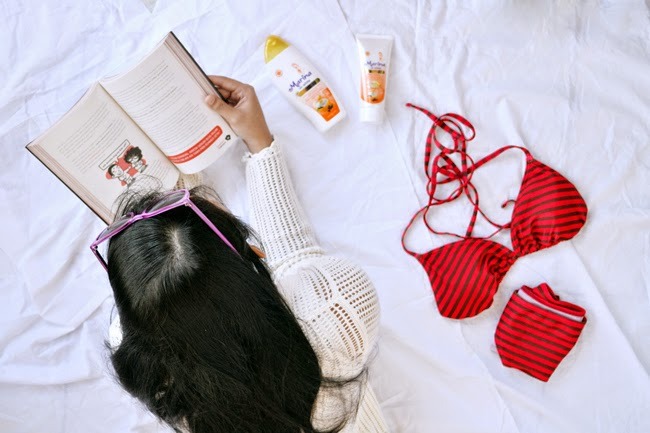 I often use Marina UV White Extra SPF 15 with Yogurt and Sunflower Essence Hand & Body Lotion before, but the newest Marina Body Essence one with SPF 30 and 10x White Yogurt Boost will be the best pick to face the extreme weather. Marina Body Essence UV White Extra SPF 30, which contains 30 times to protect the skin from UV B damage causes sunburn, actinic keratosis, and skin cancer. The content of PA ++ in it had 4-8 levels times more to protect the skin from dangerous UVA rays that can cause darkening of the skin, skin damage, and black spots. While Vitamin B3 and E make the skin look more white. It’s not just about how to still look pretty even your daily activities will always under sun rays, talking about to be a fashion blogger is not easy to get one good photo, a lot of things sacrificed to make a good post. We are willing to burn our skin and allow it to dry just to get the best photos. Sometimes we forget to take care of our skin and give them nutrients to still look good for the next outfit post, I admit it. And I’m glad, Marina will always be the best answer for my damaged skin. Beside of my daily activity which is always under sun rays, my hobbies take place too. How Marina Body Essence deliver tangible results whiter our skin and dark dull not return? Beach and Big Motorcycle Touring are my current favorite nowadays. Did you notice how long we will burn the skin when we are under the beach sun? Banana boat, snorkeling, diving, sunbathe, lying if you do not do all that thing when you're at the beach. I also do the same, not even hesitate to wear such skimpy bikini and mini dress that make us looks all out. When the sweat comes, sometimes our body lotion faded, it’s amazing how Marina always keep the skin moist though we were sweating, it’s not a big problem even though we always do outdoor activities. 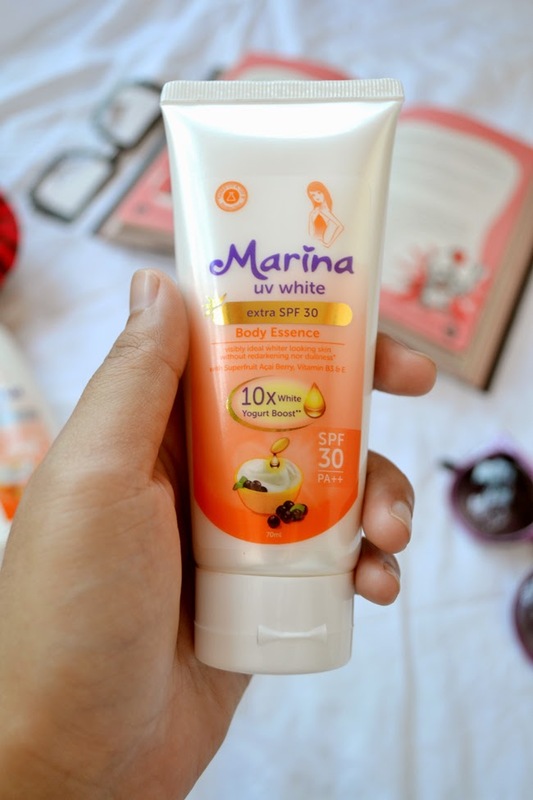 Dealing with harmful sun rays is not a problem anymore since Marina Body Essence always keeps my skin stay smooth, healthy and glowing. Not only that, I trust Marina Body Essence as my protective shield against my skin, Motorcycle Touring across the province that I have ever done spent 10 hours traveling above motorcycle and did not break my spirit to advance until the destination because I knew Marina always be my mainstay when my skin began to feel dry. After 10 hours of riding I’m sure that I always want my skin look bright and shining right. Counting as much as I can, maybe ten times I've did the Motorcycle Touring passes through the dusty streets and transportation pollution but my skin always stays supple, always look light and dull skin never come back! Their soft scent will always be my favorite. So many variants available so you can choose the fragrance that you like most and thank you Marina for your awesome products, girls you should try and you will never regret! Self preparation before Swimming! Marina Body Essence Extra SPF 30 & Marina UV Extra SPF 30 White Hand & Body Lotion.